Philips releases Hue Sync app for PC and Mac: Enables you to sync your Philips Hue lights with games/videos/music played on your computer. Signify* today announces the global launch of Philips Hue Sync, a free app that enables you to perfectly synchronize your Philips Hue lights with games, videos and music played on your computer. The new entertainment software runs alongside the Philips Hue app and works on any Windows 10 or macOS (Sierra and later) computer. 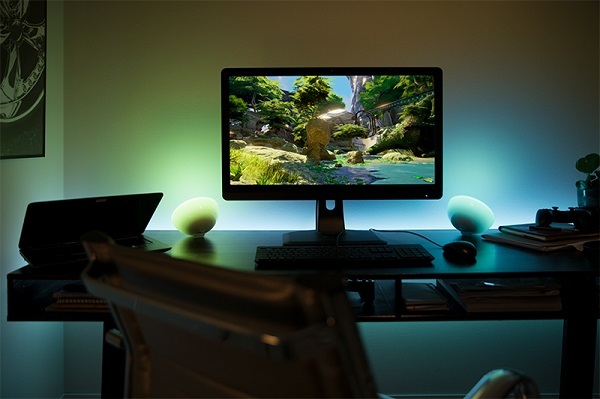 Philips Hue is the natural ingredient of any gaming, movie or audio experience - delivering an unprecedented level of spatial immersion. Imagine you're playing an action game and your lights mimic the explosions on the screen. Or, when watching a stunning sunset in a movie, have your living room bathed in the same violet, orange and yellow hues you see on the screen. And finally, experiencing music reaches a new level when your lights dance to the beat of your favorite tracks. computer, with one press of the button. Offering various customization options, Philips Hue Sync is tailored so that the lighting experience meets your personal preferences. Appreciating that you don't always need the same level of immersion on every occasion, the software offers a way to change the brightness levels and to change the speed in which lights are changing. You can select between 'Subtle, Moderate, High and Intense'. For audio, Philips Hue Sync gives different color palettes that go well with the different genres of music. For example, subtle pastel colors play nicely with ambient tunes while brighter, bolder tones go better with rock and dance music. Philips Hue Sync can be enjoyed on computer and laptop, as well as on television, by streaming content played on the computer via AirPlay to an Apple TV, Google Chromecast, Miracast and HDMI. Signify collaborated with Disney Music Group to showcase Philips Hue Sync with the highly anticipated, premiere video from the new a cappella singing sensation, DCappella. The group performs the track 'Immortals', which was featured in Disney's Oscar-winning animated film, 'Big Hero 6'. As part of the collaboration, fans can enjoy the new video in a 360-degree experience. *Signify became the new company name of Philips Lighting as of May 16, 2018. But what happens when it doesn't want to do those things anymore?